If It's Too Loud...: James Williamson - "I Love My Tutu"
James Williamson is responsible for some of the greatest riffs in the history of rock. While playing with Iggy & The Stooges on Raw Power, he became a legend with "Search & Destroy," "Gimme Danger," "Raw Power," etc. He is an absolute rock god. The last thing you would expect him to be doing now is playing ukulele on a kids' song about grandparents, right? Well... here's "I Love My Tutu." Tutu is the Hawaiian word for grandmother. 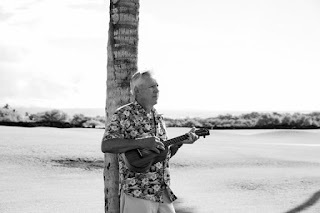 Williamson wrote it while playing ukulele for his granddaughter, and then decided to have Lisa Kekaula of The Bellrays sing the track for the recording. Most likely you'll choose Raw Power over "I Love My Tutu," but it's still a fun song, and better than 99% of what your kids probably listen to. "I Love My Tutu" will be available commercially on June 17. It will have a b-side titled "Never Far From Where the Wild Things Are," obviously inspired by Where the Wild Things Are. This is the first in a series of three singles Williamson has planned for this year. You can pre-order your copy here. For more information on James Williamson, check out his website. For more on Lisa Kekaula, check out The Bellrays' website.